I can't say enough to thank you. After my post on Song's back problem. I got so many emails and comments showing care, sharing experiences, and giving us support. Song and I are very touched and appreciate your kindness very much. Song is getting better now. After several days in bed, She was able to move around with a walker. She did a MRI and we will visit her doctor tomorrow to discuss the result. Over the weekend she was even better and could walk slowly without the walker. I had to make a short trip and she was doing well. Our life is gradually going back to normal. I am sorry I don't have an painting for you today. I will try my best going back my art as soon as I can. This week I have to do some technical work in the company I used to work full time. So I can get an income to pay our medical insurance. Then I will teach a workshop in New Braunfels, TX. Life is continuing, and I will try to paint with my fragmented time. I didn't paint for several days. My wife Song has a chronicle back pain problem. It comes back about 3 days ago, and this time is very severe. She has been completely bed bound. Standing, walking, using bathroom, and everything we take for granted she is not able to do by herself. I have paused everything and been by her side full time. We visited a back doctor today, and an MRI has been scheduled this Friday. She feels slightly better this afternoon after high dosage of Hudrocodone. Now she is in sleep. So I got a chance and did this small painting. It is quite a challenge for me too. I am a lousy cook, and made several dishes by googling recipes online. She will get better soon, and our life will go back to normal. It is amazing that life can turn very suddenly. So please be careful and treasure every minute you have, because we never know what will happen next. I have been doing many small paintings. Painting larger is not my cup of tea. Now, since I am painting more seriously, I must do more larger paintings. This one is 16" x 20". It feels like a giant to me. I spent two days on it. It is totally different ball game. I had some hard time, make quite a few mistakes, and learned a lot. I did this one from a photo. The place is a small town called "Taigu" in central China. Recently, China has been developed so fast. The economics is booming. You see new modern skyscrapers sprouting like bamboo shoots everywhere. However on the other hand, old buildings got demolished day by day. My previous visit of my home town was about two years ago. The area I used to play and go to school has been completely rebuild. "Completely" means I can't even find a single tree which I know before. When the bulldozer went across, thousands of years culture crumbled into dust. Very soon the scene showing on this paintings will be completely disappeared from this planet. I guess that is the motivation I want paint this one, and perhaps many more in the future. I plan to go back to China more in the future and do more plein air and maybe workshops in this kind of culture locations, before it goes away. Yesterday was one of those "nothing works" day to me. It was a hot day, but I decided to do a plein air painting anyway. I checked PAA website and got their paint-out location, and packed my stuff and got going. After one hour driving, I arrived, and found nobody was there. I realized that the paint-out was scheduled for next week. OK, it was not a big deal. I found my spot and started painting alone. Then I found I didn't have the palette knife I like. You know how much I like the knife work recently. I felt a little disappointed, but that should be the reason to stop me. I started put out more paint on the palette, and that make me sad. I found I didn't have the white paint, and I was planning to paint a white church. Well, what can I do? I put away my stuff, and went home. Is that what you call the "Murphy's Law"? This painting here, I did it last night. I placed a computer monitor on my still life stand, and painted from a photo I took in the morning. I do not recommend painting from photos, if you haven't painted from life for a while. Since I have painted from live objects for several years, I am going to paint from photo reference more in the future. I have reached another milestone today: I have 1000 people following my blog up to now. I feel so grateful that I have so many people liking my paintings. Your support encourages me to explore more in the art world. Texas has come back to the over 100 F temperature. So I stay indoor and did this high key still life. My colors are getting subtler. I tried to establish a airy perspective like we do in landscapes. When I painted the pot, I softened deliberately its edges and decreased the value contrast of the shadow. I felt I can enhance the depth of the painting with the value contrast variation. There is so much fun and so many possibilities. After hosting amazing painting workshops given by Calvin Liang and Zhaoming Wu, I am very excited to announce that the internationally well know Australian artist Colley Whisson will come to Austin and teach a 3-day painting workshop on March 16 - 18, 2012. Colley is very good friend of mine. His landscape and interior paintings are full of light and energy. I love his way of using color; very energetic and impressionistic. He can make his paintings with very high luminosity. Sometime I feel I need to wear sunglasses to see his paintings. He has a very painterly style. I really enjoyed his calligraphic and expressive brush works. Colley has published multiple books and DVDs on painting, and his work has been featured in major art magazines. 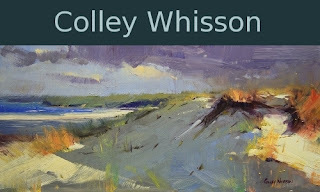 In case you are not familiar with Colley's art, please check Colley Whission's website. I want to share this wonderful opportunity with you to learn from the master painter who is so good and from so far away. Please check Colley Whisson workshop information. Colley and I would love to meet you in the beautiful wild flower season in the Texas hill country. I did this painting really early this morning. I have these morning glories in my back yard. They bloom beautifully, but as soon as the sun shines on them they quickly collapsed. I started this plein air painting around 7:00 AM. It is also my very first morning glory painting. This is Mission San Jose in San Antonio, TX. I got up early yesterday and drive two hours to attend the plein air paint-out organized by the Oil Painters of America. It was a hot day, so I found a spot with shade. When I started, the Mission was completely in shadow. I only can see a dark silhouette. Apparently, It wasn't good for a painting. However by observing the movement of the sun, I could anticipate the right side of the Mission will be lit in two hours. So I worked on composition, perspectives, and proportion for a while. I was right. Around noon time, the right side was lit up beautifully. So I had this painting portraying the image in my mind. The experience with this painting makes me think: following the law of nature we can get what we need much easier than conquering nature destructively to get what we want. Unfortunately, human did too much of the latter. After I previous painting post, the response was phenomenal. I got so many comments and emails. There are about 95% positive messages, and 5% negative. It is very valuable piece of data for my art development. I like all the messages. They help me in different perspectives. I really really appreciate your input. Thank you so much. My today's painting is a plein air piece. Yesterday, I joined the local Plein Air Austin group and painted at the Hill Country Water Garden. This is my first lily pound painting. I wasn't very confident when I started, but it turned out all right. My palette knife work is a keeper now. I have seen I used it more and more. Now the weather in Texas is getting better. You will see more of my plein air landscape paintings. My recent experiments in art have pushed me out my usual way of painting. I feel I am in an intersection, and I am a little confused which directions I should go. I did this 9"x12" yesterday and kind of like it. There is no doubt that the painting is getting more abstract. However, I was doing my best to keep the forms of the tea kettle and the white bowl as accurate as possible. So the painting is still representational. With the realistic presentation of my subjects as an anchor, I tried to push the envelope with color and brushwork as abstract as I can, so I can push the dynamics and energy to a higher level. There is definitely a balance issue. I am wondering how far I can go. Please help me to keep my sanity checked. If you don't like the direction I am going, please do not hesitant to let me know. I believe that it is the failure of the artist if the art does not communicate. I would like to keep this painting to myself for a while, I might send it to a gallery show in the near future. At the time I was painting my previous painting “Neighbor’s house”, the house of my friends Carol and David Marine was burning in the most severe wild fire in Texas. They have lost almost everything. Thank God they are safe. I was so sorry when I heard this devastating news yesterday. I want devote my current painting to help them. I sincerely hope you can help too. The donation can be made by visiting: http://www.noonesthebitch.com/http:/2011/09/05/carol-and-david-lost-their-home-a-fundraiser/ Thank you. Jade is so popular in Asia. I don't see many people wearing jade here in America. I heard that wearing jade is not only for its beauty, but more for its therapeutic effects. Jade pendents can help to calm down emotional disturbances, and protect your heart. Well for this painting, I like Jade for its translucency and graceful green color. I had this small jade cup for a long time, but I haven't painted it often enough. For this painting my main purpose of putting this jade cup in is to contrast the purple color of the drapery. It is a beautiful day today, cool and breezy. The temperature is only 100 F. After so many super hot days, I felt very refreshing, and decided to do a plein air. I didn't go out, but went up to my balcony. The subject is the doorway of my cross street neighbor. Several days of color study and palette knife practice made this painting like a piece of pie (or cake whatever). I feel very happy about it and I am looking forward more cooler days coming and more plein air opportunities. I want to devote this painting to the recent Daily Paintworks Challenge: fundraising to help the children of Africa. The fund will be donated to the American Red Cross for the children of Africa. Painting white drapery is challenging and it is relevant to my recent shadow color study as well. Like leaves and flowers, drapery can be both difficult and easy. The difficulty is that the structural information is hidden behind apparent arbitrariness. You need to really analyze and practice to understand the relationship. However, after you understood, painting drapery becomes easy because it is more flexible and forgiven than an apple and a cup. I am not so good at giving titles of my paintings. As the continuation of my colors in shadow experiment, I tested introducing blue into my reflection. I know red and orange are good eye catching colors, but I want to see if other colors can do the same or similar. I know the objects in this painting are difficult to be related. However, they are simply color manipulators to me. I am getting close to what I really want in high key paintings. My cadmium red is moving out of my apple. I am using darker values painting my white mug. I have a piece of red paper, but I bleach out its color in the light area. My major color design is in the shadows. My previous gray study has paid off. For the background, I used cadmium green pale plus manganese violet with white.